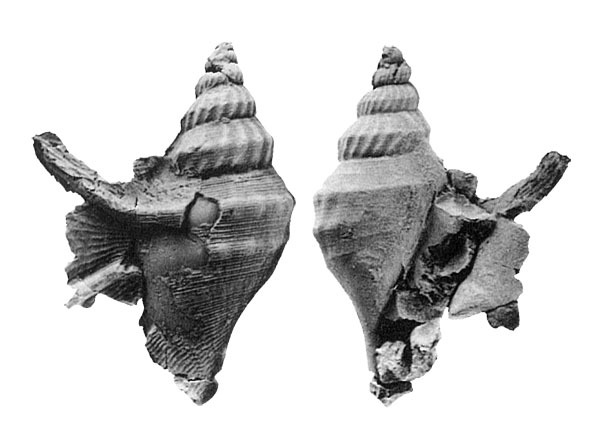 "Shell average sized for Aporrhais, moderately high spired, pleural angle about 44°; about six post-nuclear whorls, angulate near mid whorl on spire, biangulate on body whorl; suture impressed; protoconch unknown; varices randomly present on early whorls; growth line antispirally concave on spire. Juvenile sculpture of fine collabral ribs; adolescent sculpture of about 20 rounded arcuate ribs, strongly noded at the mid whorl angulation; ribs greatly reduced on body whorl but producing strong nodes on posterior and anterior angulation; three nearly equidistant spiral cords on body whorl, strongest on posterior angulation and weakest anterior to anterior angulation; surface of body whorl covered by fine raised spirals, about three per mm, becoming stronger and fanning out onto wing; posterior and middle cords (primary cords) forming two angulations and digitations on wing. Outer lip expanded palmately to form wing. Inner lip with finger of callus extending adapically beyond the first suture, callus broad and rather thin parietally, thicker and with more defined edge at basal sulcus. Rostrum moderately short and narrow." Locus typicus: LACMIP (Natural History Museum of Los Angeles County, Invertebrate Paleontology), loc. no. 15295, south side of Silverado Canyon, 1025'N, 150'E of SW cor. sec.8. T5S, R7W, EI Toro quadrangle, Santa Ana Mts., Orange County, California, USA. Type specimens: Holotype LACMIP no. 11373; Paratypes LACMIP no. 11375 and 11376 from CIT (California Institute of Technology), loc. 1058 (= LACMIP loc. 10890), LACMIP no. 11374 from CIT loc. 1065 (= LACMIP loc. 10891), LACMIP no. 11377 from CIT 1064 (= LACMIP loc. 10893). Geographic distribution: Known only from the Ladd Formation, Baker Canyon Sandstone and lower Holz Shale Members, Santa Ana Mountains, Orange County, California, USA. Etymology: The species is named for Robert Drachuk, an amateur collector, who found the holotype of this species and donated it to W.P. Popenoe.